PARIS -- A series of unprecedented attacks on popular night spots killed at least 120 people in the deadliest violence to strike France since World War II, officials said. President Francois Hollande condemned it as a terrorist attack and pledged that France would stand firm against its foes. The worst bloodshed was at a concert hall hosting an American rock band, where scores of people were held hostage and attackers hurled explosives at their captives. Police who stormed the building, killing three attackers, encountered a bloody scene of horror inside. Paris police prefect Michel Cadot said the attackers at the Bataclan rock venue blew themselves up with suicide belts as police closed in. He said the gunmen first sprayed cafes outside the venue with machine gunfire, then went inside the concert hall and killed more before the assault by security forces. In addition to the deaths at the concert hall, a police official said 11 people were killed in a Paris restaurant in the 10th arrondissement and other officials said at least three people died when bombs went off outside a stadium north of Paris. Cadot said the one set of attackers was at the stadium and at nearly the same time the second group attacked within the city. 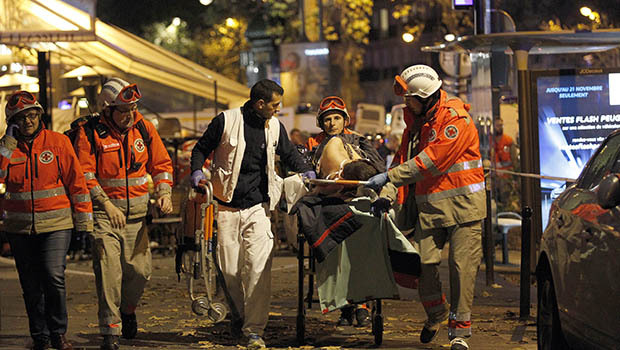 The Paris prosecutor's office said early Saturday that eight attackers were dead, seven of them in suicide bombings. Prosecutor's office spokeswoman Agnes Thibault-Lecuivre told The Associated Press that the eighth attacker was killed by security forces when they raided a concert hall where the assailants had taken hostages. She said it's possible that there are terrorists still at large. The Paris police prefecture told residents to remain home and avoid going out unless absolutely necessary. There was no immediate claim of responsibility for the attacks, and no clear picture of how many attackers were involved and if any were on the run. Jihadists on Twitter immediately praised the attack and criticized France's military operations against the Islamic State of Iraq and Syria (ISIS) extremists. Witnesses in the concert hall described hearing attackers say "Allahu Akbar." Hollande, who had to be evacuated from the stadium when the bombs went off outside, said in a televised address that the nation would stand firm and united. "This is a terrible ordeal that again assails us," he said. "We know where it comes from, who these criminals are, who these terrorists are." Hollande declared a state of emergency and mobilized the military. Under French law, the state of emergency can be decided in the event of "imminent danger following serious breaches of law and order." The state of emergency allows state authorities to forbid the movement of persons and vehicles at specific times and places. They can also define protected areas and safety areas where the movement of persons is controlled. The order also allows police to perform house searches day and night - instead of performing them only at daylight. The attacks come as France has heightened security measures ahead of a major global climate conference that starts in two weeks, out of fear of violent protests and potential terrorist attacks. Earlier Friday, two explosions were heard outside the Stade de France stadium north of Paris during a France-Germany friendly football match. A police union official said there were two suicide attacks and a bombing that killed at least three people. The official, Gregory Goupil of the Alliance Police Nationale, whose region includes the area of the stadium, said explosions went off simultaneously near two entrances and a McDonalds. An AP reporter in the stadium Friday night heard two explosions loud enough to penetrate the sounds of cheering fans. Sirens were immediately heard, and a helicopter was circling overhead. Emilioi Macchio, from Ravenna, Italy, was at the Carillon bar near the restaurant that was targeted, having a beer on the sidewalk when the shooting started. He said he didn't see any gunmen or victims, but hid behind a corner then ran away. "It sounded like fireworks," he said. A woman who said she was at the restaurant told France 24 television that diners fell to the floor when gunshots were directed at the restaurant's window. She told France 24 that a woman lying next to her had a fatal injury. Management for the rock band Eagles of Death Metal, who were scheduled to perform Friday at the Bataclan concert hall, said they were "trying to determine the safety and whereabouts" of the band and its crew. The American band, formed in 1998 in Palm Desert, California, was celebrating the October release of "Zipper Metal" with a European tour. Obama: Paris attacks "a heartbreaking situation"
At the White House, President Obama called the attacks an "outrageous attempt to terrorize innocent civilians." A senior U.S. law enforcement official told CBS News senior investigative producer Pat Milton the FBI has offered whatever help is needed to France. The FBI was meeting with French law enforcement late Friday. A Department of Homeland Security official told CBS News correspondent Jeff Pegues that DHS was closely monitoring the unfolding events in Paris and "we remain in contact with our counterparts in the region." At this time, the DHS official said, there was no specific or credible threat to the United States. The official went on to say that "DHS will adjust our security posture, as appropriate, to protect the American people" and coordinate with state, local, federal and international law enforcement and intelligence partners. A New York police official said that the NYPD was stepping up security at all high profile locations in New York City as a precaution. The official said there was no current specific threat and that the decision to beef up security was made as a precaution. Ex-CIA insider: Paris terrorist attacks took "operational sophistication"
France has been on edge since January, when Islamic extremists attacked the satirical newspaper Charlie Hebdo, which had run cartoons of the Prophet Muhammad, and a kosher grocery. Twenty people died, including the three attackers. The Charlie Hebdo attackers claimed links to extremists in Yemen, while the kosher market attacker claimed ties to ISIS. This time, they targeted young people enjoying a rock concert and ordinary city residents enjoying a Friday night out. One of at least two restaurants targeted Friday, Le Carillon, is in the same general neighborhood as the Charlie Hebdo offices, as is the Bataclan, among the best-known venues in eastern Paris, near the trendy Oberkampf area known for a vibrant nightlife. The country has seen several smaller-scale attacks or attempts since, including an incident on a high-speed train in August in which American travelers thwarted an attempted attack by a heavily armed man. France's military is bombing ISIS targets in Syria and Iraq and fighting extremists in Africa, and extremist groups have frequently threatened France in the past. French authorities are particularly concerned about the threat from hundreds of French Islamic radicals who have travelled to Syria and returned home with skills to stage violence. Though who was responsible for Friday night's violence remained a mystery, ISIS is "clearly the name at the top of everyone's list," Brian Michael Jenkins, a terrorism expert and senior adviser to the president of RAND Corp., said. Jenkins said the tactic used - "multiple attackers in coordinated attacks at multiple locations" -- echoed recommendations published in extremist group's online magazine, Dabbiq, over the summer. "The big question on everyone's mind is, were these attackers, if they turn out to be connected to one of the groups in Syria, were they homegrown terrorists or were they returning fighters from having served" with ISIS, Jenkins said. "That will be a huge question."